Back when Rise of the Hutt Cartel came out, I played through its story on Republic side and immediately wrote a post about it. Then I didn't play the Imperial side of the story until nearly three months later, and it ended up feeling completely different - this changed my first impression of the Republic storyline considerably. To avoid this happening again, I decided that I wasn't going to review Shadow of Revan's story until I had seen both sides of it. After having played through the Republic version three times and the Imperial version once, I think I'm finally in a position to formulate a well-rounded opinion. First off, experiencing the story of Shadow of Revan on both sides of the faction fence immediately reveals its biggest flaw: that it's the same for both sides. In a game where the levelling content for both factions is nearly 100% unique (exceptions are the shared flashpoints and the rare times when the story overlaps, such as with "the thing Czerka found" on Tatooine), this is a big deal, and not in a good way. Having two factions and not making them feel different is a big issue. I took Blizzard to task for this in Cataclysm (where there was in-game evidence of quest NPCs and their quest text literally having been copy and pasted to the other faction hub) - though to be fair, from what I've read about the game they seem to have gone back on this at least a little since then and injected WoW with some new faction-specific stories again. However, in a game that prizes its storytelling as highly as Bioware does, this kind of thing is an even bigger faux-pas. There are two reasons I'm not more up in arms about it. First off, it makes sense from a story point of view, and we've never had a story quite like this before. Republic and Empire have previously fought against common threats, such as on Oricon, but they were never actually united in this. If anything, there was always an edge of competition to the feel of these storylines, of proving that your faction had a handle on the situation while the enemy clearly didn't. Shadow of Revan is the first time that multiple representatives of the Republic and Empire actually work together against a common enemy, and considering the scope of the threat that is revealed eventually, it makes sense. I'll be okay with this being what it is, as long as it doesn't become a trend to save money on production values. Speaking of which, this is the second reason I'm willing to forgive Bioware for making the story the same for both factions - because, somewhat bizarrely to be honest, they didn't try to reduce production costs nearly as much as they could have. That is to say, while some lines of dialogue are identical across factions, most of them aren't, even when they easily could have been. In fact I found it strangely fascinating during my first Imperial playthrough to observe how Bioware made each scene play out slightly differently, even as I already knew the eventual outcome. The early bar scene on Rishi is a great example: the actual sequence of events that occurs there is exactly the same for both factions, but for some reason the dialogue is ever so slightly different: the barkeep chides people with different words, the Rodian insults you in a different manner, and your choice of responses is slightly different as well. It's almost as if Bioware's writers wrote different versions of each scene and at the very end they assigned them to the two factions in a mix and match pattern. I say this because I didn't notice a clear faction bias - in some cases I found the Imperial version more informative or atmospheric, in others the Republic version. Either way this gives me hope that we're not headed towards a future of blindly copy and pasted faction stories. Seeing Darth Marr and Satele Shan co-operate for once is both interesting and novel... but let's not make a habit out of it. Now I've said a lot about Shadow of Revan's story without actually talking about the story itself. Apart from following the same lines for both factions, is it any good? Personally I think the answer is yes, though it's not without flaws. I think one thing Shadow of Revan's story does extraordinarily well compared to many other stories in the game is flow. With many of the existing planetary stories, I've often felt that the only reason I know that they are approaching their end is because I'm being sent to the last zone on the planet. Otherwise they just kind of plod along - you usually know where you want to get to eventually, but until you can actually go there you first have to go down a checklist of tick boxes, such as disabling some generators or taking out a certain highly-ranked mook. Shadow of Revan doesn't feel like that. It starts with the mystery of why you're being sent to Rishi, which is light-hearted and gets resolved quickly. Then you start fighting the Revanites and their allies, and that bit does feel pretty standard - until it's revealed that all this is part of an even bigger plan that needs to be foiled and requires Empire and Republic to agree to at least a temporary truce. Then you go to Yavin 4 and the ante gets upped even more. The tension between the factions is palpable, and a big surprise revelation awaits. Basically, the story starts out small and builds up to something really big, and you can feel that throughout. Pre-3.0 I had read that the devs wanted to use Shadow of Revan to finally put a proper end to Revan's story. I honestly wasn't sure how this was supposed to work, because as far as I was concerned his story had already ended in the Foundry, and seemingly bringing him back from the dead was kind of the opposite of giving him a good ending. The final showdown with Revan and its ending convinced me though. This was a better ending than simply having him go insane and die at the end of a mid-level flashpoint, plus it set up the next big threat very nicely. It was an ending that left me satisfied, and after the camera zoomed out from my character and her NPC allies I half expected Star Wars credits to start rolling. 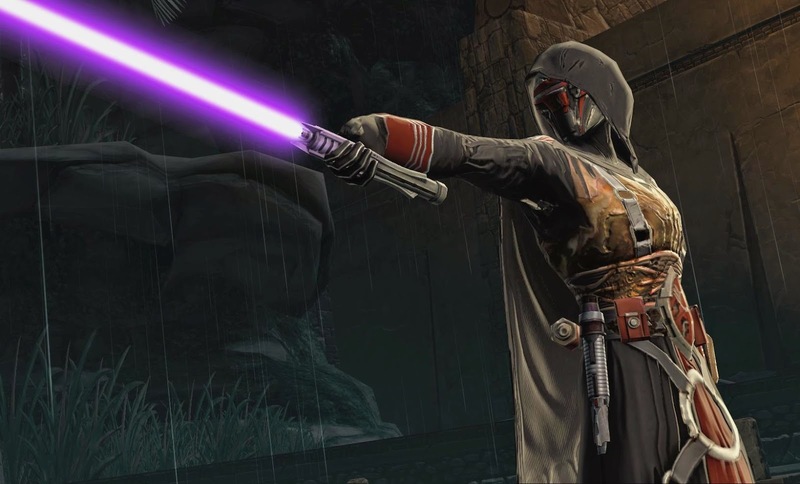 Fun fact: This iconic and frequently reused shot of Revan can only be seen in the Imperial version of the story. It could also be argued that Shadow of Revan's story is (too) short, which depends on your perspective. It's true that it isn't a WoW expansion with ten new levels of fetch quests to keep you busy. 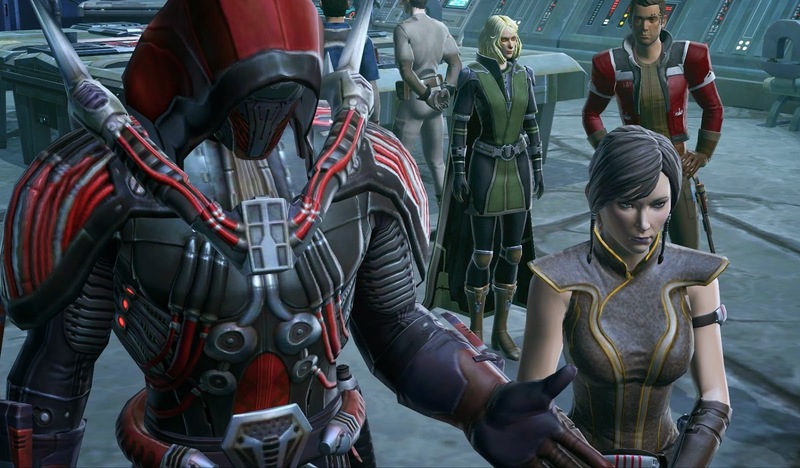 But compared to SWTOR's own previous story expansion, it holds up well. I haven't actually timed it, but after having replayed Makeb only recently, I'm fairly sure that SoR offers just as much, if not more story in terms of actual conversations. It just feels like it goes by more quickly because Bioware made a conscious decision to include less "padding" in the form of quests that send you all around the houses just to talk to a single NPC, or bonus missions that ask you to kill 50 mercenaries. I consider that a good thing to be honest, and I think it's telling that less than a month after release, I've already completed this storyline on four characters, while I already felt sick and tired of Makeb after only two playthroughs right after its launch.